"The Yamaha Piano is one of the finest piano brands in the world." Below is our list of Yamaha piano review articles. If you've played or own a Yamaha, have some cool information, tips and tricks or pictures about them to share, send them here. You'll be taking part in creating the Web's ultimate Yamaha Piano resource that will ALWAYS REMAIN FREE for everyone! 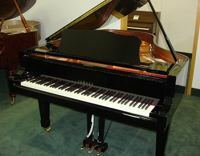 Rubbing my hands with excitement, I sat down to play the Yamaha C6 concert conservatory grand piano for our C6 review. At 6'11", the C6 is a big piano with rich, pleasing tones and great deep bass notes. What's great about Yamaha pianos, in general, is their phenomenal craftsmanship. You can literally sit down to two different C6s play them and their action and tone would be nearly consistent. 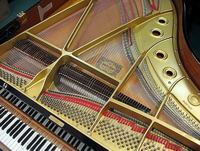 Not so with many other brands of pianos...Read more. The Yamaha C5 piano is the next size up from the C3. At 6'7", and 770 lbs (66 lbs heavier then the C3) the C5 has much of the same features as the C3. Some of these features include Ivorite keytops, the tone collector system, duplex scaling, Humid-A-Seal pinblock and more. Where the C5 Yamaha piano shines is in the bass region...Read more. In 1902, Torakusu Yamaha, founder of the Yamaha Corporation, built the first Yamaha grand piano. Two years later, the Yamaha grand piano won the Honorary Grand Prize at the St. Louis World's Fair. Today, the Yamaha C series grand piano is easily the most recorded and recognizable piano in the world...Read more.